Throughout the history of the Church, God calls sinners to repent and change their evil deeds, and this process of repentance is critical for us to enter someday the Heavenly Kingdom. Accordingly, St. Paul advises us “let us lay aside every weight, and the sin which doth so easily beset us, and let us run the race that is set before us.” (Heb 12:1) The story of this icon is a visual tale of this process of deep and lasting repentance. 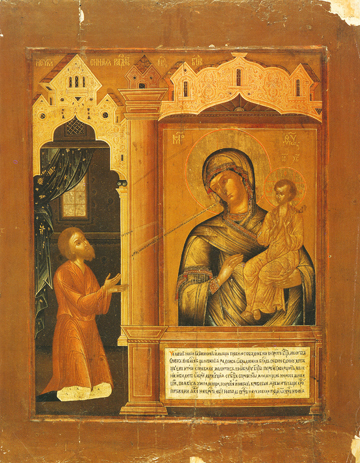 A sinful man was still devoted to the Mother of God, the Virgin Mary, and daily venerated her icon (showing her holding Christ), saying “Rejoice, O Blessed One….” Once when about to leave to seek sin he came to the icon to pray and was awestruck as the figure of the Virgin on the icon began to move, and the wounds of the hands, feet, and side of Christ began to bleed. The man was appalled and asked why this was happening, and the Virgin replied that it was his sins and other sinners who crucify anew her Son. The man repented and after forgiveness, he experienced the great “Unexpected Joy” of now drawing closer and closer to God through this icon. The words of their dialogue are seen spelled out.